Synopsis: From MangaUpdates: Eiji is a teenager who's rough and rude and loves to fight. However, Eiji has a strange power; when he comes in contact with certain objects, he can see people's memories from within the objects themselves. When he finds himself involved in a dark murder case, he assists a beautiful young profiler to find the murderer. Afterwards, she continues to ask for his assistance in more complicated investigations. 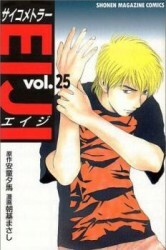 A detective manga with intriguing and complicated cases and a variety of characters from the complex to the caricature.